Thanks to modern technology, we do not have to go underground to preserve our wines. Wine cellars of our day offer the environment where hundreds of wines can age and mature in total calm for years as if they were in an actual underground cellar. The manufacturing and installation of wine cellars involve as much expertise as their design do. One of the most important reasons a cellar must be realised by a specialised team is the issue of insulation. 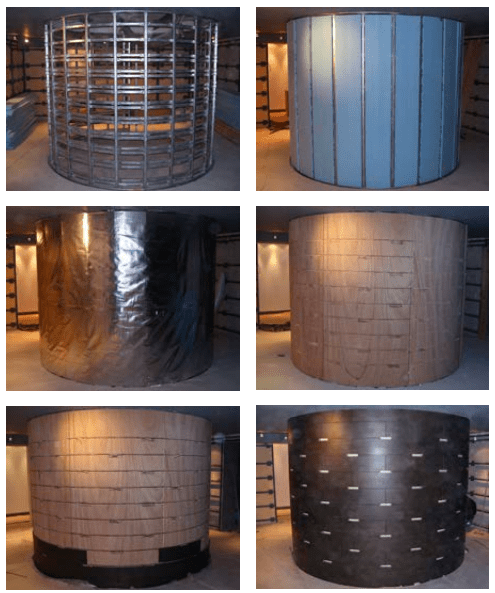 Insulation is fundamental for sustaining the necessary physical features of a wine cellar, including temperature and humidity control. Insufficient thermal insulation and vapor barriers cause undesirable circumstances such as wide temperature fluctuations, extreme humidity, mold and odors. Temperature fluctuations result in the fast oxidation of wine while extreme humidity damages bottle labels and undesirable odors can taint the bouquet thus ruin quality. In other words, more than the degree of temperature, it is the prevention of temperature fluctuations which plays the crucial role in an ideal wine cellar. Cellars by FWC are equipped with purpose-built, state-of-the-art wine cellar air-conditioners which ensure that the cellar’s temperature is always at the adjusted degree and the critical temperature fluctuations are avoided. These highly sensitive pieces of equipment will function properly only when and if the cellar space is sufficiently and correctly insulated.